Providing adequate shade in parks is essential to encouraging visitors to drop by more. When visitors know they won’t overheat and understand they can seek refuge in a comfortable, shady spot on a bright day, it’s easier for them to make the decision to visit the green space you’ve worked so hard to design! Proper shade also helps keep active visitors from overheating on sunny days and can protect everyone from the sun’s rays, especially when they’re spending lots of time outside. Shade can even cut glare, so when exciting events are planned, audiences can see better. You have lots of options when it comes to offering shade. We’ve created this guide to providing shade in your park to help you make the best choices. ■ How much space do you have for your shade? Do you have room for lots of trees, or are you better off with a cantilever shade structure that has minimal posts? The smaller your space, the more important it is to find shade solutions with a small footprint. ■ What is the terrain like? If the ground is sandy or bad for trees, shade structures may be a stronger option. If you live in an area where flooding or extreme weather is a risk, choose highly stable and durable shades. ■ Do you want public park shade structures or natural shade, such as trees? Trees can blend in more easily with a green space, but you need to consider pests and how long it will take trees to grow. In addition, think about whether root systems will harm garden areas, benches or recreation areas. If you’re considering shade structures, think about your budget, needs and the look you would most like to see. ■ Where is shade most needed? Look at where park visitors tend to linger for a while. Whether it’s by picnic tables, benches or a favorite spot to watch sports, these are the areas where shade is important. Also, keep an eye out for any areas that overheat and anywhere park visitors tend to be active. These spaces may need some shade to keep things cool. ■ What visibility considerations do you need to think about? Make sure your proposed shades are not blocking views of bandstands, sports fields or a great view. If you have a playground, for example, make sure parents can supervise children without being encumbered by a shade post. 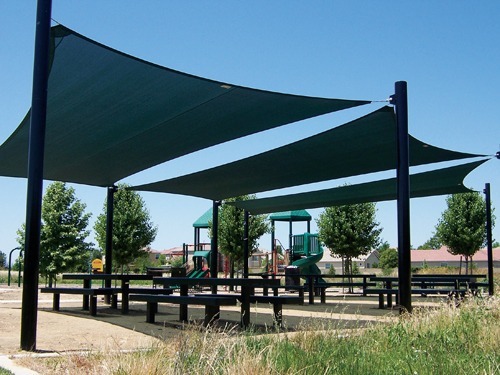 PlayPower Canada has years of experience providing shade in public parks across the country. We offer a range of shade solutions, from ones with small footprints to larger shades that cover more space. We can even help customize your park area with a personalized shade designed for your unique needs. 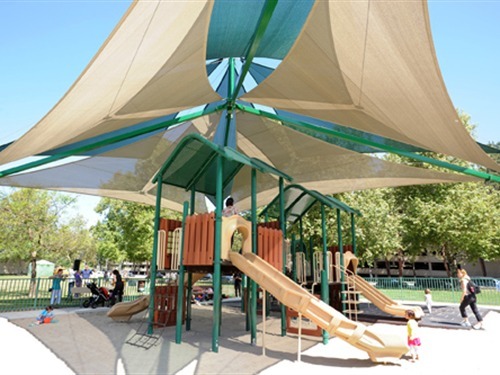 Contact us today to start discussing your park shade structures.